In 597 A.D. St, Augustine, a great Roman missionary, came to Kent to try to convert the pagan Saxons to Christianity. He was well received by the King of Kent and people all over the country became enthusiastic supporters of the new religion. Among them was Anna, the King of East Anglia, who lived at Exning, a village close to Newmarket about twelve miles from Ely. 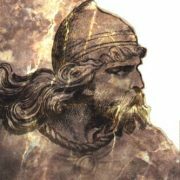 The King had four daughters, Princesses Withburga, Sexburga, Ethelburga and Etheldreda. Like her Saxon father, King Anna, Etheldreda became an ardent Christian and would like to have devoted her life to religion, but for political reasons it became desirable to marry her to Tonbert, the Prince of the South Gyrvii, whose territory bordered East Anglia. Picture below: From an engraving of one of the 14th Century carvings in the Cathedral Octagon. 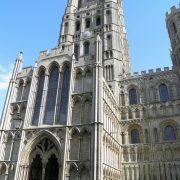 The wedding took place in the year 652 and, as a dowry, Tonbert gave Etheldreda the land and royal rights of the Isle of Ely. Tonbert died three years later. For five years she lived on her estates, but once again policy necessitated her marriage to a prince, this time Egfrith, heir to the Kingdom of Bernicia in the north of England. Egfrith was much younger than Etheldreda and the marriage was not happy. After twelve years she obtained her husband”s consent to retire from worldly affairs and she entered the convent of the Abbess Ebba, King Egfrith”s aunt, at Coldingham, where she received the veil and clothing of a nun at the hands of Bishop Wilfrid. A year later she set out for the Isle of Ely. 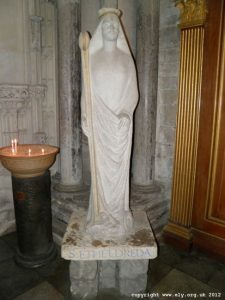 The project was assisted by Bishop Wilfrid, who consecrated Etheldreda abbess of the new monastery, which she continued to rule for some years, setting an example by her piety and disdain for comfort. Hot baths were regarded by her as a luxury and she took only about four a year, and those at times of important religious festivals. She became a victim of plague which caused a large swelling in her throat. This was lanced by her surgeon, but she died on 23rd June, 679. Sexburga, succeeded her as abbess. 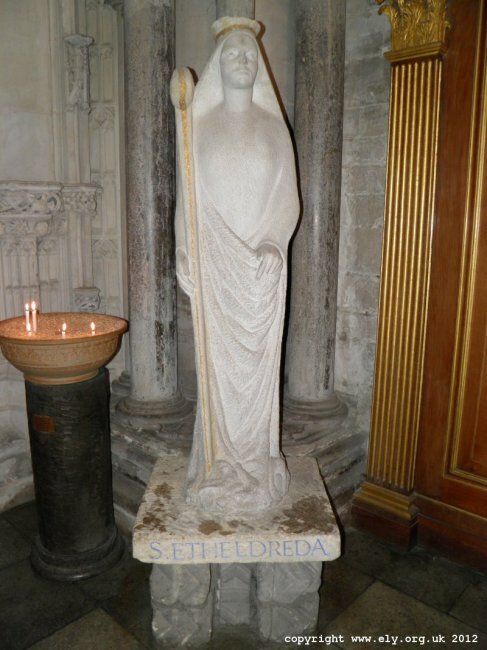 The photo of St. Etheldreda’s Statue above was taken inside Ely Cathedral. See more photos taken inside Ely Cathedral.